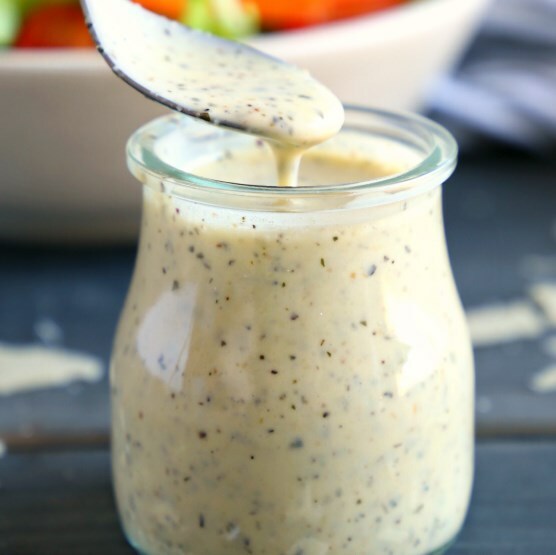 This Classic Creamy Italian Salad Dressing is a formula for the books! It has all the exemplary Italian dressing flavors and it runs superbly with any greenery enclosure plate of mixed greens. Include a sprinkling of crisp Parmesan and you'll be in plate of mixed greens paradise! Bricklayer containers are an extraordinary kitchen apparatus to have close by for formulas like this Classic Creamy Italian Salad Dressing. They're sealed shut, so you don't need to stress over spills, they're dishwasher protected and simple to clean, and they're incredible for something other than serving of mixed greens dressings – I use them for smoothies, hand crafted jams, soups, and other nourishment stockpiling. This Classic Creamy Italian Salad Dressing formula is one for the books! It's pressed with tasty herbs and makes the ideal expansion to any garden plate of mixed greens! Also, it's SO natural to make! Add all ingredients to a large mason jar and shake very well until combined. Store in the fridge for a few hours before serving, or serve immediately over your favourite garden salad. Visit bit.ly/2I6Yj2u for full instructions.